If the building’s façade is unassuming in a single shade of softgrey, stepping through the front door of Hooküm Brewing Company in downtown Ridgefield is an eye-pleasing experience. Light streams in from a plethora of windows, and warm, natural wood finishes adorn the walls, ceilings, table tops and the polished plank bar. The welcoming ambiance is rounded out with modern overhead lighting, chalk-drawn menu boards, and shelves filled with colorful Hooküm t-shirts for purchase. Outside, a large gravel patio holds a bevy of tables and chairs, accessible in the fair weather via a large, roll-up glass door. Much of the craftsmanship at Hooküm was provided by Ridgefield residents Rachel and Nathan Hipple. 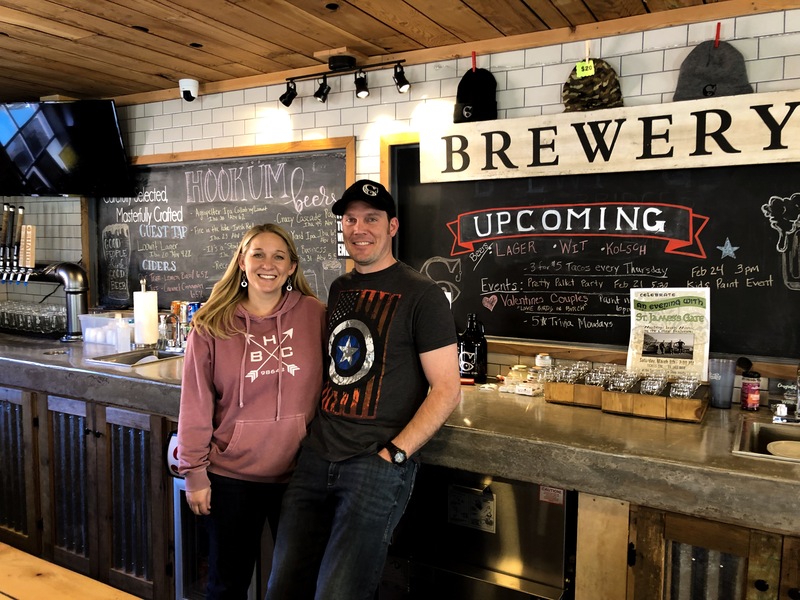 The couple are the managing partners of downtown Ridgefield’s only microbrewery, which is on tap (pun intended!) to celebrate its first anniversary on July 3. The name Hooküm and its logo are an amalgam of things, including the “hooks and ladders” found in firefighting; fishing, for which the area is wellknown, a nod to the region’s Native Americans, and the umlaut (the little dots over the ‘u’ in Hooküm) brings in a German beer-loving, emphasis. Nathan works as a Vancouver firefighter and paramedic, Rachel is an on-call nurse, and the couple is raising two teenage boys. Launching a business, however, doesn’t seem to have slowed their strides. 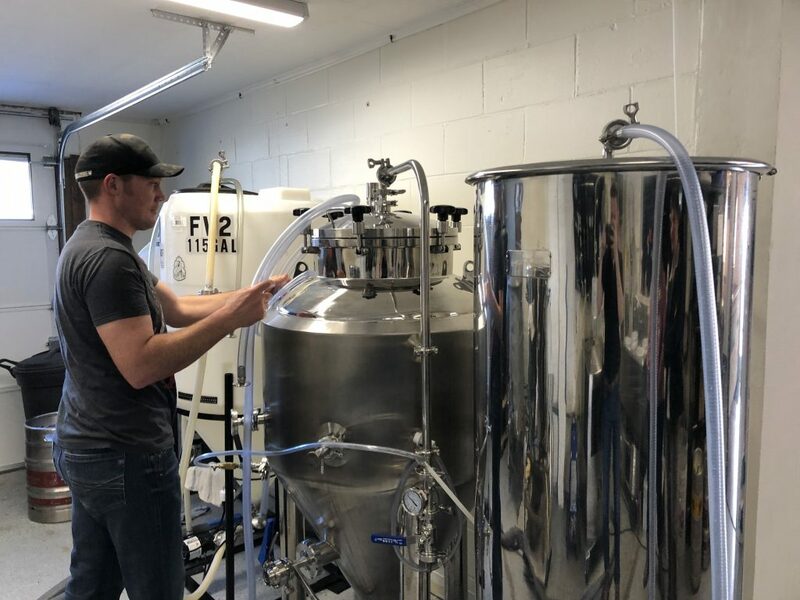 A recent sunny afternoon at their storefront found them exuding excitement when discussing the birth of Hooküm, and the choice of downtown Ridgefield as their brewery’s location. Rachel serves as the scheduler and merchandiser for Hooküm, family and friends serve as part-time staff, and Nathan is the brewmaster. He started brewing in his garage about five years ago, motivated in advance of a Super Bowl party. “I was ‘hooked’ from there on out,” Nathan said. Hooküm brews a variety of craft beers, including a popular Front Yard IPA, a stout, and much in between. Availability changes with the brewing cycles. A few hard ciders are offered, but Hooküms liquor license doesn’t allow wine on the premises. Children are allowed during all open hours, board games and cards are available, and fun is encouraged. In Hooküm’s intimate space, a full kitchen isn’t possible, so already -cooked snacks are on hand. Several local restaurants, however, stepped in to solve the dilemma for those who wish both a beer and a bigger bite. Customers can order food from El Rancho Viejo, Vinnie’s Pizza and End of the Road Grill. All three restaurants deliver to the brewery. Hooküm has several silent investment partners, one of whom is Rachels’s dad, Bruce Wiseman, a Port of Ridgefield commissioner. “Let’s just say Bruce has developed a taste for craft beers,” Nathan said with a smile. For more information including special events call 360.727.2115 or find the brewery on Facebook or Instagram at hookumbrewingco. Hooküm is located at 120 N. Third Ave.